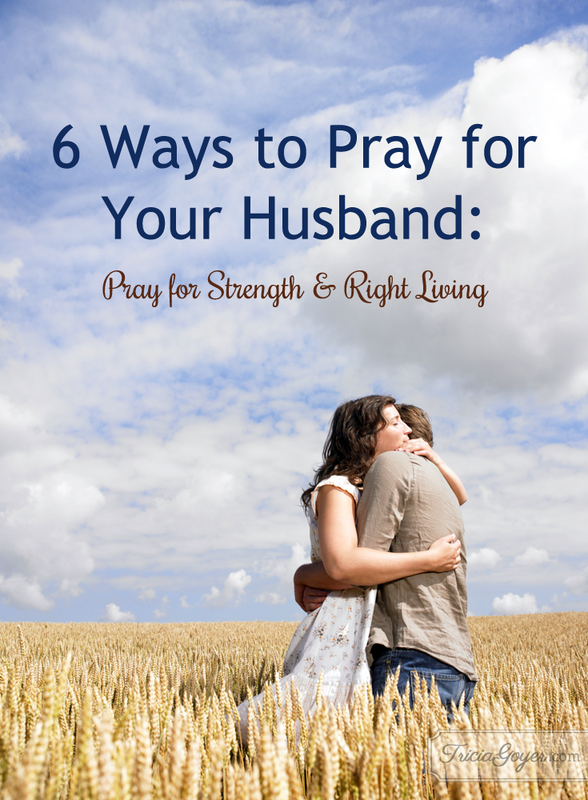 There are many things we can pray for our husbands, but one thing we continually need to pray for is strength. We live in a world with darkness all around. Everyday our husbands are assulted with unholy attitudes, foul displays of ungodliness, and temptations that appeal to his flesh—even as his spirit battles against them. Friends, we need to pray for strength for our husbands to stand against temptation. We need to pray that our husbands will have tender and repentant hearts so that when they do stumble and sin—because all of us stumble and sin—our husband will turn to God. We need to pray for our husbands to stand strong on earth but also look with expectancy to heaven, and the gift of eternity with God. These are things that I’m praying for my husband, and these are prayers I urge you to pray for your husband, too. And because I know that the word of God is powerful I’ve wrapped these prayers around Scripture verses. I’ve also included Scriptures to reference, too! Won’t you pray along? I guarantee that your soul will also be touched and transformed as you pray for your husband. Lord, be with __________ today. 1. I pray that my husband may seek first Your kingdom today. Help him to live righteously. And as he seeks you, Lord, I pray that You will provide everything he needs today. And show him what his true needs are, compared to what the world says he needs. Thank you for providing for every one of his needs, Lord! 2. Fill my husband with Your Holy Spirit and inspire him to life right and true according to Your Word. Strengthen his hands and knees. Guide him on a straight path and hold him up, so that he can be made strong. 3. Help my husband guard his heart. I know, Lord, that where his heart is that will direct the course of his life. I know that where his heart is, that is where his treasure will be. I pray his heart will be first to You, second to his family, and third to the mission and purposes you’ve designed for him on earth. 4. I pray that my husband will be humbled before You today. I pray that You will make him aware of the schemes of our enemy and make him strong to resist those schemes. I pray that he will desire to come close to you. I pray he will make the time to come to you. I thank you that You are always close when my husband approaches You. I pray that he will wash his hands from all the filth that he picks up just walking through life. I pray that if there is anything that my husband needs to seek repentance for that he will do it quickly so that he will not have to carry around heavy burdens and regretful thoughts. I pray that whenever his loyalty is divide between You and the world that He will always choose You. 5. I pray that my husband will turn to you to search and test his heart. I pray he will turn every anxious thought over to You. I pray that my husband’s heart will be tender so that when you point out areas of weakness that he will gladly and joyously turn over those offenses to You. I pray that you will lead him along the path of everlasting life, and I thank you that although there are struggles in this world that there will be no pain, shame, darkness or struggles and stumbling when we spend eternity with you. 6. I pray that when my husband gets overwhelmed today that he will cry out to you. Lead him to Your towering rock of safety. Thank you, Lord, that You are his safe refuge. Thank you that at this moment You are surrounding my husband with a barrier of protection—and that no enemy can reach him. I pray that my husband will look forward to worshiping in your eternal sanctuary forever, and that you will give him a glimpse of Your holy presence here on earth. May my husband always stay safe between the shelter of Your wings. Thank you, Lord, for listening to my prayers for my husband. Thank you for always hearing my prayers. How amazing is that that we can come before God and ask for our husband’s protection. Know that as you pray God hears you. If your husband is a God follower, thank God for that now. If your husband is not following God then pray these prayers in faith! Either way, print and bookmark this page. 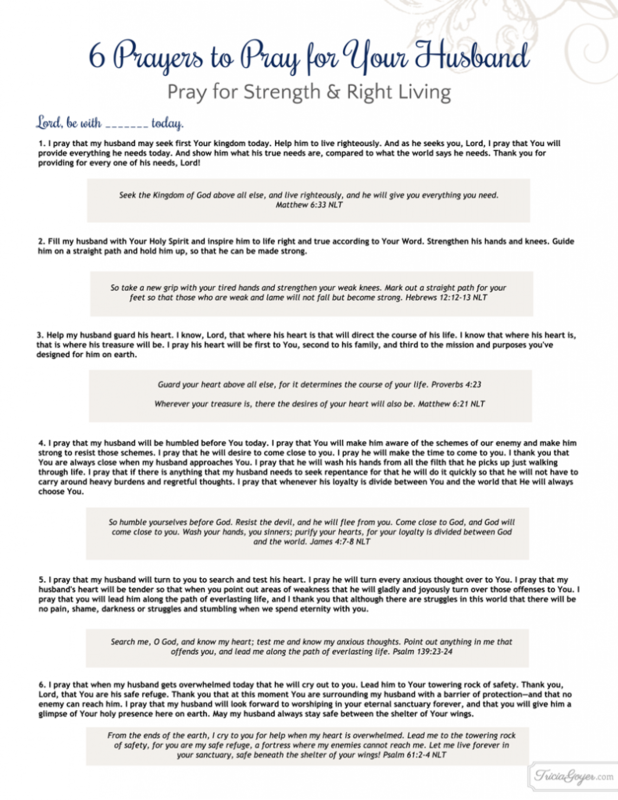 I’ve also included a free prayer prompt printable. Print it up. Post it where you will see it often, and remember to pray for your husband through the day. Prayer makes all the difference! Thank you! Though I do pray for my husband each day, and often with scripture, this was so perfectly timed and exactly what we both needed today. Praise God for all he is doing and will do in our husbands and in us because of these prayers we have lifted up today. Wow! Such a powerful prayer and so well written! I truly believe the Lord guided me to find this. I prayed this for my husband and afterwards felt moved to pray it for myself. I pray for my husband every day, but this one brought so much more comfort to my heart that I will use this prayer from now on. Thank you for sharing and inspiring. God bless. Oh Tricia, thank you for this. We are in the midst of a battle and this is EXACTLY what I needed.